RANGELY | The economic feasibility of building an off-channel dam and reservoir next to the White River between Rangely and Meeker at a cost of $119 million to $191 million was questioned last Wednesday at a meeting in Rangely. “I just don’t see how it’s feasible economically, even though I do support it, and that’s what I’d like to see you build,” said Tom Gray, a member of the Yampa/White/Green basin roundtable, which was holding a rare meeting in Rangely to learn more about the project. Gray is a former Moffat County commissioner, represents Moffat County both on the basin roundtable and on the Colorado River District board, and is a member of the state’s Interbasin Compact Committee. Gray made his remarks after a presentation to the roundtable by the Rio Blanco Water Conservancy District, which is based in Rangely. The district has refined options for an off-channel reservoir that would hold between 41,000 and 130,000 acre-feet of water pumped 3,100 feet up from the White River. Earlier in the day Gray had toured the potential reservoir site, where the dry Wolf Creek basin joins the White River valley, about 23 miles upstream from Rangely on Hwy. 64. The district says there is a need to store water to meet the long-term needs of the area, including for Rangely, for energy production and to re-time water in the river for endangered fish. But Gray’s comments at the meeting, which was attended by the mayor of Rangely and about 20 local citizens, put some cold water on the project. “I’ve always supported your opportunity to take care of your future needs, and be proactive and do something, and I still am,” Gray told Alden Vanden Brink, the manager of the Rio Blanco Water Conservancy District, who also sits on the River District’s board alongside Gray. 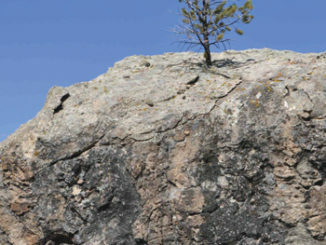 Gray said a smaller reservoir, perhaps around 20,000 acre-feet, might be a better fit with future potential demands. 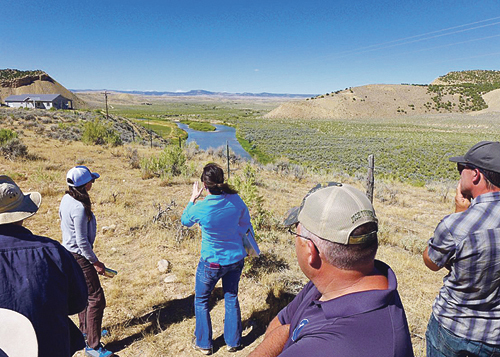 The Rio Blanco Water Conservancy District’s board voted April 29 to pursue an off-channel reservoir on Wolf Creek over the alternative of building a dam across the main stem of the White River. The district is now studying two reservoir sizes at the off-channel location. One option is a 41,000 acre-foot reservoir that would include a 20,000 acre-foot “working pool” of water. In that working pool would be 1,600 acre-feet of water for municipal and industrial use, mainly for the Town of Rangely, 3,500 acre-feet for oil and natural gas use, 8,500 acre-feet for oil shale production, and 3,000 acre-feet for environmental flows. That adds up to 16,600 acre-feet, and for planning purposes, the district has rounded-that up by 3,400 acre-feet to reach a 20,000 acre-foot working pool. On top of that in the 41,000 acre-foot reservoir there would be a 15,000 acre-foot recreation pool for boating, a 3,000 acre-foot pool to absorb sediment, and a 3,000 acre-foot pool in case the pump fails. The dam forming the 41,000 acre-foot reservoir would be 155-feet-tall and 2,100 feet long and would cost $119 million, or $2,900 an acre-foot, to build. The potential 131,000 acre-foot reservoir would include a 90,000 acre-foot working pool, with 3,150 acre-feet for municipal use, 3,500 acre-feet for oil and natural gas use, 42,300 acre-feet for oil shale production, and 42,000 acre-feet for environmental flows. The larger reservoir would also include 15,000 acre-feet of water for recreation, 3,000 acre-feet for sediment, and 22,000 acre-feet of water against pump failure. The dam forming the 130,000 acre-foot reservoir would be 177 feet tall and 2,300 feet long. It would cost $191 million, or $1,500 an acre-foot. Brad McCall, a senior project manager at EIS Solutions representing the Rio Blanco Water Conservancy District, responded to Gray’s comments on Wednesday, emphasizing that the ultimate size of a reservoir will be shaped by demand for the water from entities who are willing to spend money on the project. Editor’s Note: Aspen Journalism is an independent nonprofit news organization. See www.aspenjournalism.org. RBC I For decades, residents of Rio Blanco County have heard rumors that a new dam is going in somewhere along the White River and soon there will be a new reservoir. Dear Editor: Times are tough for the natural gas business in Northwest Colorado. But tough times don’t diminish the appreciation our association has for partnerships in Rio Blanco County.